This evening I made a quick and easy dinner using fresh single ingredient foods. 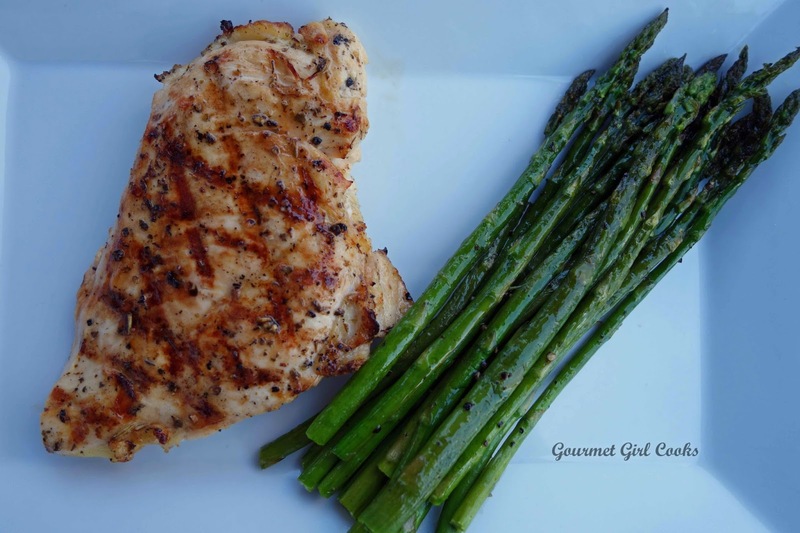 Since it was another beautiful, warm day here...we decided to grill out for dinner again. This afternoon I pounded boneless chicken breasts until they were even in thickness and then placed them in a large Ziploc bag and added the freshly squeezed juice from 2 lemons, about 1/4 cup olive oil, 2 teaspoons of Italian seasoning, and plenty of freshly ground sea salt and black pepper. I placed it in the fridge and let it marinate for about 4 hours. 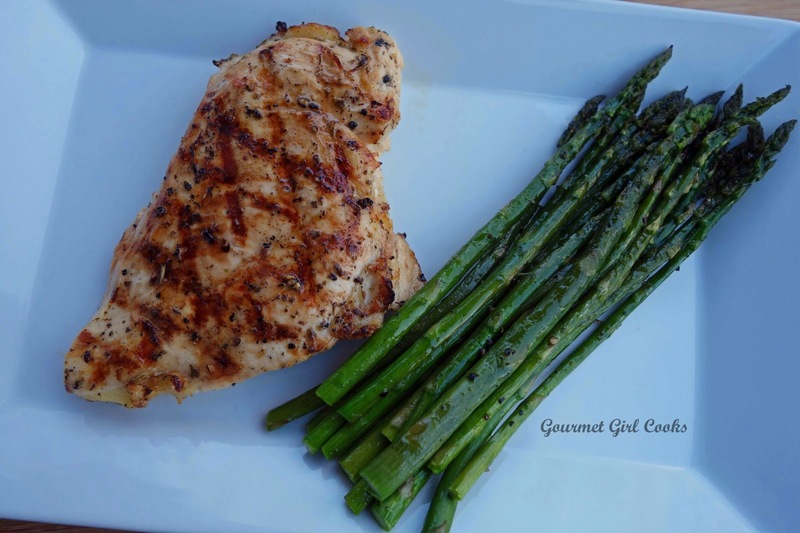 While hubby grilled the chicken, with my supervision, of course (check out those grill marks...LOL), I prepared the asparagus by cutting the ends off and placing it on a foil lined cookie sheet and then drizzled it with olive oil, sea salt and freshly ground black pepper and tossed it around to evenly coat. I placed it in a 375 degree oven to roast for about 15 to 20 minutes (you can also roast it at 400 degrees for a little less time, depending on the thickness of your asparagus). My sons came for dinner tonight so we also put a couple of filet mignons on the grill so they could choose what they wanted to have -- my oldest son had steak and my younger son, hubby and I had chicken. I baked a potato for my oldest son to go along with his steak and hubby and younger son had rice with their meals. 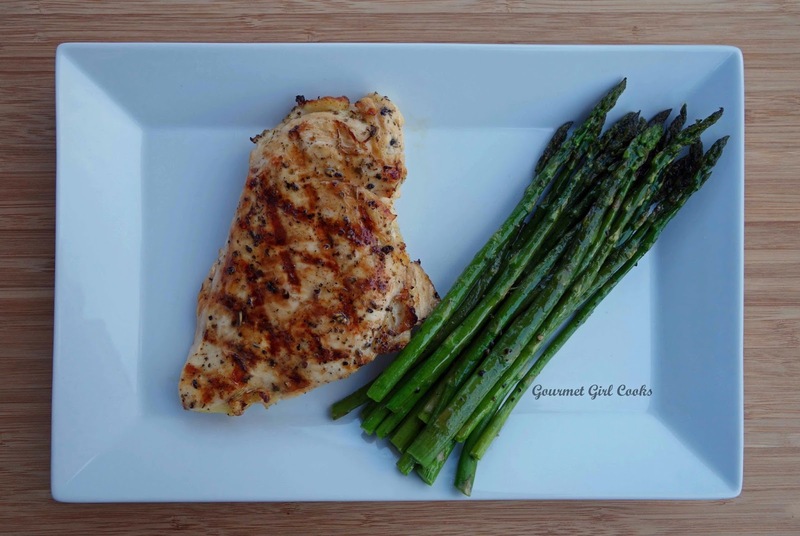 I was totally content with my grilled chicken and asparagus. It was another simple "real food" and single ingredient based meal. I snapped a few photos for you to see below. Enjoy!